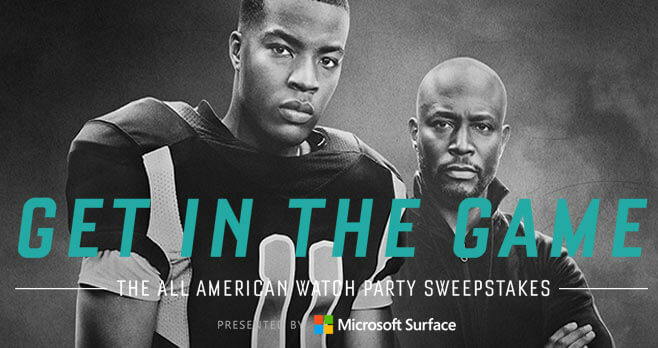 Get in the game with The CW All American Watch Party Sweepstakes at cwtv.com/VIP and you could win a trip for two to L.A. to attend a VIP Watch Party and score a Microsoft Surface Pro. The CW All American Watch Party Sweepstakes is open to individuals who are at least 18 years of age on the date of entry, and who are a legal resident of and physically residing in one of the 48 contiguous United States or the District of Columbia (excluding Alaska, Hawaii, Puerto Rico, Guam, American Samoa, United States territories, possessions and protectorates, foreign-based United States military installations and wherever restricted or prohibited by law). The Sweepstakes begins on October 16, 2018, at 12:00:00 a.m. PT and ends on November 8, 2018, at 11:59:59 p.m. PT. You may enter the Sweepstakes once per day for a total of 24 Entries during the entire Sweepstakes Period. The grand prize consists of one (1) three (3)-day, two (2)-night trip for the Prizewinner and one (1) guest to the Los Angeles, California, area. Visit cwtv.com/VIP to enter and see Official Rules for details.